LG as a company has many products and certainly offers some strong competition. Their product line includes HDTVs and computer displays, smartphones and smart watches, fitness bands, home appliances, audio accessories, commercial AC and lighting, and numerous other offerings; in short, LG is a brand we’ve all encountered. 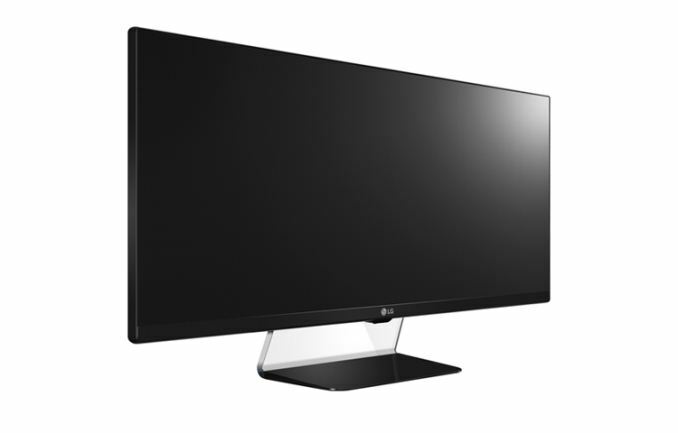 Given their strong presence in the HDTV market over the years, computer displays should be a strong category for LG, and with one of the first shipping FreeSync displays, LG is at the front of the pack as far as new technologies are concerned. But being first doesn’t necessarily mean being best. As the first FreeSync display to cross our desks, the LG 34UM67 has some good and bad elements. In many ways it feels like the larger version of the LG 29EA93 we reviewed a while back, albeit in an improved design and with most of the early 21:9 issues having been ironed out. The price is also lower now, so for less money you can get a more capable 34” display instead of 29”. But with FreeSync being the marquee feature, the supported refresh rates of 48-75 Hz can be something of a problem. But let’s not jump too far ahead. Fundamentally this is a computer display, so let’s talk about the design, features, and other elements before we continue. After testing the two previous TN-based G-SYNC displays, the Acer XB280HK and the ASUS ROG Swift PG278Q, the change back to an IPS panel is immediately noticeable. From an ideal viewing location it may not matter as much, but get off axis at all and IPS is definitely superior. The color quality also looks quite good out of the box – not sufficient for professional use, perhaps, but definitely better than most lesser panels. In terms of connectivity, LG includes multiple input options: DisplayPort, HDMI, and dual-link DVI-D are present. There are also two 7W downward facing speakers in the screen, with audio in/out ports on the back. One thing you won’t find however are any USB ports. The built-in stand likewise offers no height adjustment, rotate, or swivel – the only thing you can do is tilt it forward/backward. There is a 100x100mm VESA mount, however, so the stand at least can be replaced. From an ergonomics perspective, the built-in stand isn’t very good, but it does at least provide a good level of support (which is often an issue on budget displays). Power is provided via a power brick, which is unfortunate and likely unnecessary – the bulk of the display should have easily allowed for placing the power circuit inside the chassis. There are also no cable routing features, so all the wires simply connect directly into the back of the display above the stand hinge. Moving to the OSD (On Screen Display), LG offers plenty of options. The controls consist of a 4-way nub located at the bottom-center of the panel, and while it might not seem ideal I didn’t find it to be particularly problematic either. The nub also serves as the power button if you press it when outside of the OSD menus. All of the usual settings are present, including various color modes, brightness/contrast, the ability to tune the RGB output (and even a more advanced option that allows adjustment of six colors (Red, Green, Blue, Cyan, Magenta, Yellow – both hue and saturation can be altered), and input selection. Areas where LG adds extras to the OSD include the PBP (Picture Beside Picture) mode, where you can do a split screen view while using two connections, gaming modes designed to improve (in theory) pixel response times and reduce input lag (DAS aka Dynamic Action Sync), and of course the option to enable/disable FreeSync. I don’t know why it’s necessary to inherently provide the option to disable FreeSync, though – if your GPU doesn’t support the standard, the display should simply function as normal with a static refresh rate. I want to note that the DAS mode and FreeSync actually caused problems on at least one occasion, as the first time I booted with the display connected FreeSync was disabled and when I turned it on the screen went black and never came back on – I had to restart the PC but then things worked properly. DAS did the same thing when I turned it off at one point, though this time power cycling the display fixed the issue. After that, DAS mode was grayed out, and it’s not clear why that’s the case. Disabling FreeSync didn’t allow me to change DAS mode, but switching to one of the preset picture modes other that Custom brought back the option to change the DAS mode. It looks like there’s are a few minor bugs in the display firmware, but personally I tend to set up a display and then rarely change things, so it’s not a huge concern. If you happen to regularly tweak the OSD settings on your display, however, you might find the current 34UM67 OSD to be a bit irritating. I also missed the option to adjust the OSD timeout; it's about 20 seconds with no way to make it any longer. As it stands, it’s neither the best nor the worst OSD menu that I’ve encountered, and in general it does what it needs to do. At just 1080p feels like a waste to go there. Even 1440p doesn't feel like enough if you are gonna invest this much in a new screen. At 650$ it's a 5 years or more purchase not 1-2 years. And that's mostly 4k territory.